Summertime is event season throughout the Bay of Quinte region. Residents love to get outside and enjoy the beautiful weather and there are fun events to be found practically every weekend during the summer. For more than 30 years the Belleville Waterfront & Ethnic Festival has welcomed tens of thousands of people to Belleville’s waterfront for a weekend of live entertainment, midway rides and delicious food from around the globe. Every August several vendors from across North America fire up their bar-b-que’s in Zwick’s Park for a great cause. Quinte Ribfest combines outstanding food with live music entertainment, beer gardens and a Kid’s Zone with the proceeds used to support programs and services which benefit children and youth in our community. The Empire Theatre transforms its parking lot in Downtown Belleville for a three-day rock and roll festival every July. They bring some of North America’s most famous musical acts for this annual music spectacle that brings out thousands of music fans each night. The Trenton Scottish-Irish Festival is a two-day event promoting and celebrating Celtic culture and heritage in Centennial Park. Enjoy Scottish and Irish themed food, vendors and exhibitions during this annual celebration of culture. Culture Days raises the awareness, accessibility, participation and engagement of Canadians in the arts and cultural life of their communities. With the support of volunteer groups at the national, provincial and local levels, hundreds of thousands of artists, cultural workers, organizations and groups, volunteers and supporters self-mobilize to host free participatory public activities that take place in hundreds of cities and towns throughout the country, including the Quinte region, over the last weekend of September each year. The Belleville Downtown Improvement Area works with the businesses in Downtown Belleville to present several events throughout the year. Some of the favourites include the Downtown Street Dance, Plein Air Art Festival, Movies Under the Stars and Summerlicious where you can get samples from Downtown’s favourite restaurants and vote for your favourite. Celebrate Canada Day on July 1st throughout the Bay of Quinte region with fireworks, live music and other entertainment. You can expect to see lots of Canadian flags, giant Canadian flag cakes and everything will be painted red and white to celebrate the nation’s birthday. New Canadians are invited to be part of the celebration. Belleville’s Zwick’s Park, Centennial Park in Trenton and Downtown Picton are all great locations to show your Canadian spirit on this national holiday. One of the first signs of the holiday season is the arrival of Santa Claus parades in our communities in November and December. 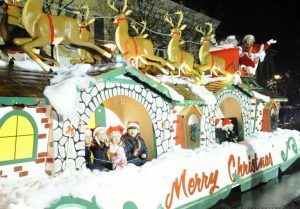 Local businesses and organizations create elaborate floats to showcase themselves and thousands of families dress warmly and enjoy hot chocolate and other treats while taking in the parades. Frostfest is one of the best ways to enjoy the winter season in the Bay of Quinte region in mid February. The Batawa ski hill is home to this day of family fun, entertainment and activities. The Trenton Golden Hawks hockey players are usually here to skate with kids and families on the outdoor ice rink. Frankford Riverfest welcomes in the start of summer every year on the bank of the Trent River in Frankford. Held in the middle of May, the Frankford Riverfest has lots to do for kids and families including a car show, midway fair, petting zoo, live entertainment, vendors and a spectacular fireworks display when the sun goes down. Canadian artisan cheese—in all its delicious variations—is the primary focus of The Great Canadian Cheese Festival, but Canadian fine wine and craft beer are also featured, along with a cornucopia of artisanal foods. This once-a-year sugar extravaganza features maple-themed events ranging from tours of sugar bushes to pancake breakfasts to wine and cider tastings and plenty of activities for kids. The Countylicious festival is nearly a month-long culinary celebration held during the spring and fall seasons for serious foodies and curious diners to eat, drink and experience the finest restaurants and wineries that Prince Edward County has to offer.